Tim has been working on a new blog for a few weeks now, and I get to be a co-author! I’m not sure when Tim is officially launching it, but a few people have found it already and started leaving comments and interacting. It’s focus is for people who serve in ministry. There are so many blogs we can go to get advice about how to do ministry, but we wanted to make a place that will serve people who serve. I’m really excited about the blog for a couple reasons. 1. I haven’t been very good at keeping up with this blog with taking care of 2 babies now. When I just logged in to type this up I noticed a blog post I wrote a while ago and just saved to publish, and didn’t even get around to doing that. Now I can write posts and Tim will get them published. Maybe sometime when the kids are a little older I will “re-launch” a personal blog to keep family and friends informed. 2. I have always dreamed about writing a book about life experiences of what I have learned going up as a PK and then becoming a Pastor’s wife. The blog isn’t a book, but it’s a start for me to share my experiences and hopefully help others. www.youtube.com/danaschmoyer – I’ve mainly been doing my weight loss updates. I’ve been trying to get them up every Monday, so tune in soon for the newest update! I’ve lost almost 30lbs in the last 3 months! I want to start doing a second update each week about what God is doing in my life, which has been a LOT lately, and it’s been great! I have really enjoyed making the youtube videos because it’s about as lazy and quick as it can get when I just use the camera on my computer and record right into youtube. www.youtube.com/godrox – Almost daily vlogs of our family. Just a sneak peak into what we do each day. www.ministryfamily.com – And of course, our newest blog. I am really excited to see how God uses it! 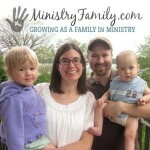 Go check out MinistryFamily.com and please pass it on to those you think it could bless. Dana, really cool website, totally needed!!!!!!!!! I grew up as a PK and MK and my hubby a PK so we totally get a life full of needing balance! It’s rough. We recently went through a period here josh was nearly fired for what he chose to do in his personal time, i. e. go to seminary and through an adoption, we weren’t supposed to have time for a personal life, ha! In the end I think the fire we went through God brought a lot of good out of for us and for the church. We’ve both been reading a book called Mad Church Disease, something you many enjoy, talks a lot about what health and burn out look like in ministry. Josh is also attending a summit in CO in August that talks about this same topic, we are glad churches and leaders and families are starting to open up and talk about this vital topic! Many blessing to you and your family as you go on this adventure. Not sure your dad has told you but this past Sunday was my last official Sunday at Williams. My husband and I have been lead to step up as the new youth directors at my old church. Will go check out your new sight for sure!! Thank you so much for sharing with others about your journey! !